The large number of political parties in Egypt can be roughly grouped into three categories, claims Daniel L. Tavana. As we anticipate the next round of Parliamentary elections following the court decision to void the results of 30 percent of the elections, it’s useful to reflect on the organization of political parties in Egypt. Daniel L. Tavana did just this in his “Party Proliferation and Electoral Transition in post-Mubarak Egypt” published last year in the Journal of North African Studies before the first round of elections. There is nothing particularly deep or insightful in Tavana’s paper (I’m not even sure I accept his categorizations) but it offers a very good general summary, very concretely organized. However, even though the latter two groups were presented an alternative to the NDP, the National Democratic Party was still the uncontested power in Egyptian politics, and a law was passed forbidding the “establishment of parties that could appeal to a widespread regional, religious, or working-class constituency.” Even though Mubarak repealed some of the most restrictive aspects of this law prior to the 2005 elections, it was still difficult for any opposition party to effectively challenge the power of the NDP. 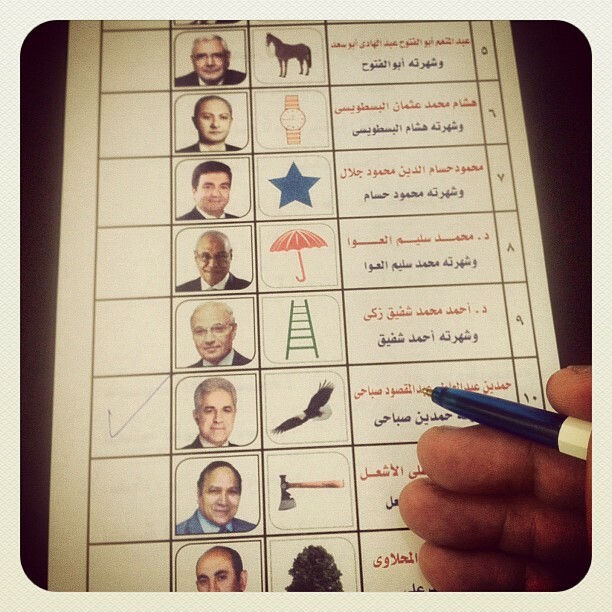 Clearly, the restrictions to political parties and elections have been greatly loosened since Mubarak stepped down. Especially significantly was the SCAF ruling that one third of the contested seats for parliament would be elected based on party listing, with the other two thirds elected by individual candidacy. This was important because it meant that both independent and party-based candidates would be able to run in the elections, which in turn helped fuel the proliferations of dozens of new political parties in Egypt. Many of the most prominent parties have long histories. This makes sense, as there still has not been time for new parties to effectively organize; however, some of the newer parties are gaining prominence at a fairly rapid rate, and were able to have an impact on the recently completed parliamentary elections. see secularism as a prerequisite for pluralism and necessary for the assurance of equal citizenship for all. A stable Egypt in which all citizens live freely and equally requires moderation, centrism, and tolerance- a characteristic many liberals believe religious groups have not yet espoused. The other concern was the state’s role in the economy. Some parties insist that neoliberalism has been a disaster and advocate a return to the statist model of Nasser and the discontinuation of privatization. Others argue that the problem was not neoliberal reforms per se but the corruption of the dictator and his cronies, and so support the continued privatization of some industries as well as a free market economy. Still other parties encourage a middle way, with the overall economy being liberalized, but with the government still having enough power to take care of the poor and elderly. Tavana breaks down the religious faction into three groups: the Muslim Brotherhood, the Salafists, and more moderate Islamic groups. Like most scholars, Tavana tries to map Islamic political parties on a map from more to less moderate. Of course, as the most cursory review of the literature will show you, one person’s moderate is another’s radical Islamist, so we must pause when we see it used as an empirical or analytical category. In Tavana’s case, the term seems to refer to the extent to which political parties say they are going to implement Islamic practice–as each sees and interprets it–into the structure of the state. The Brotherhood, fundamentally, believes that freedom must be bounded by respect for God’s law. They talk about judicial independence, but they also believe in ‘erecting a value system in society that is derived from Islamic law, and that is hegemonic over the judicial system and the legislative and executive branches. However, the group has said that they support real democracy. The Brotherhood also supports free-market capitalism, and there are signs that they would be moderate on social issues, such as their support for tourism as a major source of revenue for the Egyptian economy. First, there are segments of the Salafist movement who believe that direct political involvement could damage the message that they seek to promote. Second, (and this has been a potential cause for alarm in the West) is the movement’s apparent ties with Al-Gamaa Al-Islamiya, the armed group who actively participated in terrorism against the Egyptian state during the 1990’s. While the group is not officially affiliated with the Salafists, many Salafi leaders have worked closely with them, and this could potentially undermine the Salafis from gaining widespread power. “Liberal” again is one of those terms political analysts throw around as if it has a clear and universal descriptive meaning. For Tavana, this term refers to parties that draw their political ideologies from those of Western Europe and North America. Tavana sees the most prominent liberal party as the Wafd, which has roots in the pre-Nasserist era, originating in the independence movement against Britain. The party platform promotes free market capitalism, as well as secular nationalism, the end of the emergency law of the Mubarak years, multi-party governance, and democratic reform. However, the party is wracked with internal division and aging leadership, which limits its effectiveness in elections. There have been other liberal parties launched in the aftermath of the revolution, most notably the Free Egyptians and the Social Democrats. The Free Egyptians were founded as a way to counteract the perceived threat posed by the Islamist parties. The party “advocates for equal rights for all Egyptian citizens, the enhancement of political freedoms, the need to empower women in all domains of public life, the independence of the judiciary and the separation of powers.” The party was generally seen to be the most prominent liberal party in the run up to the parliamentary elections. The other major liberal party is the Social Democrats. The party platform promotes free market capitalism (while maintaining enough state intervention to care for Egypt’s poor) and puts a great emphasis on social justice. Leftist here refers both to parties that draw their inspiration from Nasserism, as well as those more directly linked to global socialist and communist ideologies. The most prominent leftist party is still the Tagammu. Established in 1976, the group seeks to provide a socialist alternative to the Wafd and NDP. The most prominent part of the movement’s platform is an increase in minimum and maximum wages as well as a progressive tax system. However, the party’s influence has been declining since Mubarak was overthrown, and the group was criticized for being too close to the old regime. The party particularly lost credibility with many other leftists when it participated in the fraudulent 2010 parliamentary elections, and subsequently when it accepted a cabinet position in the transitional government after Mubarak’s resignation. With the waning power of Tagammu, other leftist parties have stepped in to fill the void. However, many of these groups are simple offshoots of Tagammu, consisting of disaffected members who left the party due to their disagreement over Tagammu’s participation in the 2010 elections. The Coalition of Socialist Forces (as the collection of leftist parties is known) advocates for a complete end to privatization, as well as raising the minimum wage. However, the group is very small, so their influence is likely to be limited in the immediate future.